Meet Bessie, my 18-quart Nesco roaster. Bessie functions as both a second oven and a gianormous crock-pot. She’s big enough to roast a 20-pound whole turkey. She lives on my bar and I’m constantly making stock in her. If you need to make large amounts of stock, batch cook or have a large family, I recommend you consider a similar-sized roaster. I use it as a second oven when we have company or a holiday. It can hold three whole chickens for roasting. When I batch cook, I use it to make up huge batches of sloppy joe filing, chili, roast, and pulled pork or chicken. Thursday I finished up a batch of beef stock and started some chicken stock. 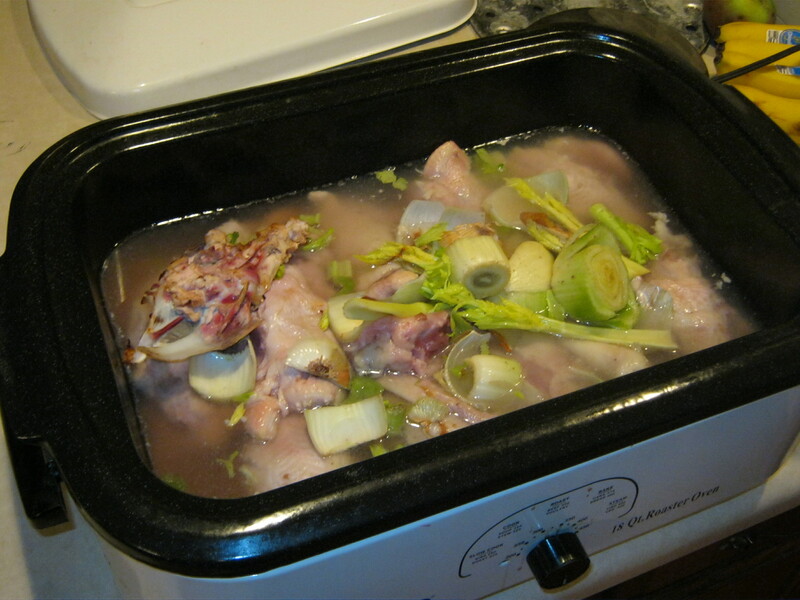 As you can see here, the bones are soaking in the water with vinegar and I’ve put some of the veggie scraps on top. That is the ends and scraps from 6 onions and 2 hearts of celery. I hadn’t filtered enough water, so I took this picture while waiting for my Berkey to finish. I added water until it is about 2/3 full and the carrot tips and peels from a 2-pound bag of carrots after I took the picture. I turned it on at bedtime and this batch will cook until Sunday afternoon. This batch is being made out of chicken backs from our local health food store along with some bones I already had on hand. Because I’m needing to make a very large amount of stock with little notice, I decided to go with backs. I called the local health food store and ordered a 20-pound case last week after Dad fell. It takes them about a week to get them in and they charge $2 a pound. There are twelve backs in the roaster. I can’t find chicken feet anywhere. I am looking forward to when a local farm has them available again. I’ll buy all I can get and put them in the freezer. It seems they are becoming more popular so they’re harder to source when farms aren’t processing chickens. Not so long ago, they were more plentiful and easily found during the off season. If this batch of stock doesn’t gel well, I’ll add some Great Lakes gelatin to it. Sunday afternoon, I will strain this batch then cook it down until it is about one gallon in volume. I will then add a few drops of Concentrace, quick-cool it in the sink and transfer it to mason jars to sit in the fridge until Monday. I will remove the fat that has risen to the top, transfer the remaining stock to ice cube trays and freezer bags, take it to mom’s house and put it in her freezer. If I am going to freeze the stock, I always cook it down gently to save on freezer space. Today I put up 2 gallons of beef stock concentrated down to 1 beautifully-gelled gallon. This batch of chicken stock will be equal to around two-and-a-half gallons and I’ll cook it down to around one gallon before freezing it. All of the stock is going over to my parent’s house to help my dad recover. This weekend we are doing a batch cooking marathon to get some food put up in the freezer to help them through this rough spot. He’s recovering at home. I greatly appreciate all of the prayers and well wishes many of you have sent over the last week. Because dad is recovering, I will not dilute this stock back to normal strength. He needs the extra nutrition and healing power, so he’ll get it all condensed. Under normal conditions, I would dilute the stock back to normal strength before use. If you do have a surplus of bones, it’s perfectly fine to consume the condensed stock. I use condensed stock to help us get through illnesses, times of stress or when we’ve been exposed to a virus. I received my Nesco catalog last week. It’s a farm girls Sears & Roebuck Christmas catalog! I put that same slow cooker on my wish list! I also am going to make every effort to join your bone broth challenge. It’s going to take a lot of commitment for that! But I know the results are well worth it. Diane@Peaceful Acres Farm recently posted..Ugly Alert! KerryAnn, you are such a gem, sharing your wisdom and honesty with us. I pray for a speedy recovery. Why have you stopped canning your broth? Does it loss something in canning? Kara, I have the freezer space for the stock right now. I only can it when I don’t have freezer space. Canning does have drawbacks due to the long cooking time. Why do you skim the fat? To cook with? I have been eating it with the soup. Andrea, according to NT, after a long cooking period the fat is potentially rancid and should be discarded. If I need to save the fat, I skim it off with a ladle after a couple of hour’s cooking time and pop it in the fridge to solidify. I normally cook my stock 48-72 hours, so I expect it would be bad by then. What kind of cookwell does your roaster have? From the Nesco website, it looks like they sell stainless steel, non-stick, and porcelain? Which do you think is least toxic? (I have heard that crock-pots can leach leach lead, and that is what I currently use to make my stock.) Just wondering if you had researched the issue. Thanks! We love your recipes! I have the porcelain. I got mine years ago before they came out with the stainless. I’d go with stainless when I have to get another one. I believe stainless would be the one least likely to leech. Ha, so funny you named your roaster! I just got a 22 quart roaster a few months back and I LOVE it. Having that along with 2 different sized crockpots and one 5 gallon stock pot gives me plenty of options for cooking lots of stocks and meats in bulk for a crowd. I often am feeding 9 people around here! Yup. 😀 I name all of my small appliances I use constantly and have a fondness for. lol Bertha is my pressure canner, Bessie is the roaster. I just picked up an 18 quart osto stainless steel roaster. I put two large pkgs of oxtails, one box pkg of beef knuckle & marrow bones & half a pint of whole garlic cloves into it, ground smoked sea salt & cracked pepper over it and roasted for a while. The plan was to roast them, then add the water and simmer for a million years, but eventually there was a smell of burning plastic that we couldn’t locate, so we turned it off. I scooped the softened marrow out and added it to the pile, then plopped it into a baking pan and baked it for a while in the oven. Once we figure out the cause of the smell, I’ll add the bones & liquid with a bunch of water to the roaster and cook for a million years. I’m also roasting a beef roast today and will dump those cooking juices and fat into the broth, too. If I have time early on, I’ll try to salvage the fat for cooking later. I use a regular oven roaster when we do turkey. Basically, when I put the leftovers away, I put the carcass back in the roaster, add vinegar and water, and put it on two burners on the stove to cook. I was just thinking. I was planning to roast my bones & feet before making into broth in my 18 quart roaster. Is there any reason i can’t just roast them in there and then add the water and let it cook from there, rather than roasting them in the oven & transferring to the roaster? The only thing I can think of is that skin doesn’t brown as well, but would that matter? Less dishes is a Good Thing, imo. That’s what I do, I just do it one layer at a time so the bones don’t get overly roasted.